I started Shortcake because I wanted to help modern families preserve and share their memories in a way that was both beautiful and easy. The inspiration came when, a little before my daughter’s first birthday, I started feeling guilty because I hadn’t been writing down her milestones and special moments in the baby book I bought for her. Both my mom and my mother-in-law had kept lovely baby books for my husband and I, so I felt awful that I hadn’t done the same. Then I thought about how I had shared most of my daughter’s most important moments with family and friends on social media, which included written descriptions, captured the date, and received some fun comments that I liked looking back on. “Somebody must have a business that will help me turn that into a nice album, right?” I couldn’t find what I was looking for, so I decided to create it myself. 2. Where do you see your business in 5 years? Today Shortcake is a custom album and photo book design service for modern families. 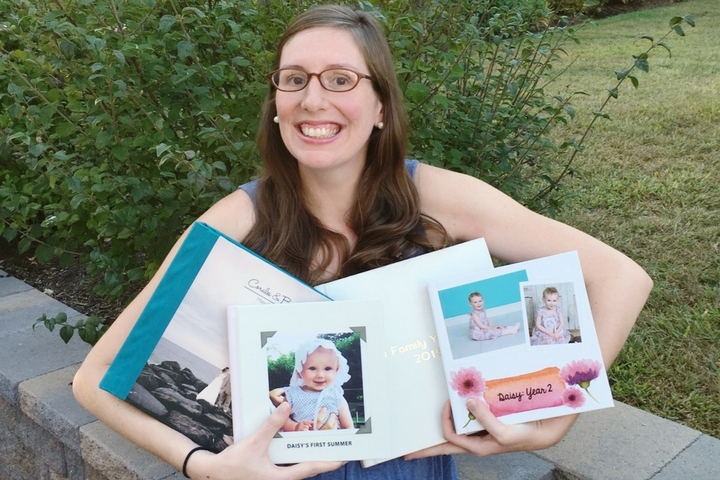 We turn your social content and family photos into premium keepsake albums. In 5 years, I see us expanding our market beyond moms and dads to grandparents, weddings, pets, vacations, and school events. We’ll implement some tech and automation into our process to help our designers work more quickly, while maintaining our hallmark personal touch and unrivaled customization options. And we will continue expanding our services beyond albums to new areas, such as greeting cards and invitations (where we’ve already begun experimenting). 3. If there was one tip you could give a working mom what would it be? 4. If you could do one thing over as a mom what would it be? Potty training. Not because I enjoyed it – exactly the opposite. I felt so helpless the first time – I had no idea what I was doing and felt like a complete failure. Now that I’ve been through it once I realize how foolish it was to put so much pressure on myself. I feel bad because I made the experience more stressful for everyone than it needed to be. It also would have helped if I had not been pregnant with our second at the time (wine would have been really helpful – I’ve realized a laid-back attitude is a must!). 5. Whats your Mom Motto? Do the best you can and give lots of hugs. Enter to win our Giveaway for your own beautiful album. Click Here to enter, one lucky subscriber to our Newsletter will win!